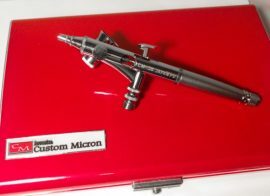 The Custom Micron Series are for the elite professional who demands precise and accurate control of very detailed airbrushing. 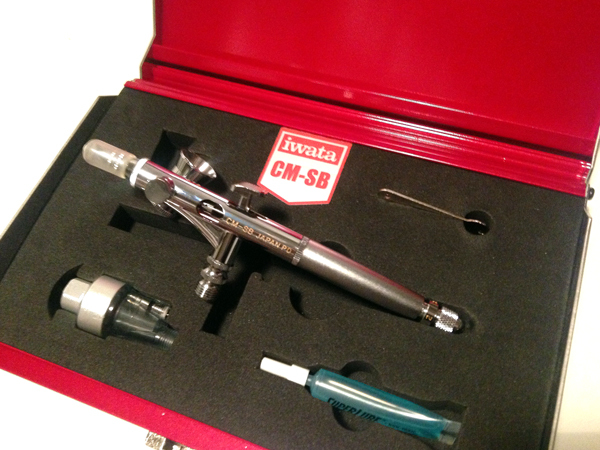 These airbrushes are reputed to be the best – the flagship of Iwata airbrushes. The special matched head systems are hand fitted, adjusted and retested until the spray characteristics are perfect, giving superb atomisation and incredible control. 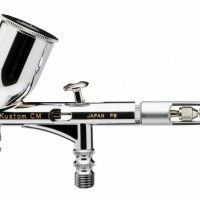 The Iwata Custom Micron new Generation! 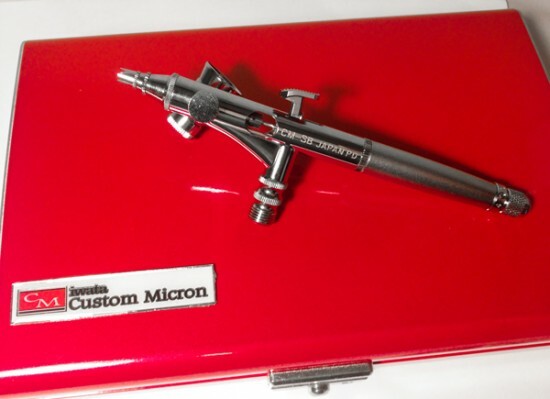 The airbrushes of the Custom Micron Series enable delicate and accurate spraying that all elite professionals demand. Our pursuit of the highest levels of performance and atomization has resulted in an extremely high quality finish. 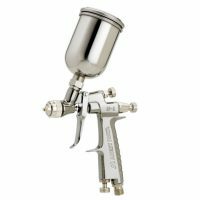 The airbrushes employ a nozzle head system that allows high atomization even at low pressures using cutting-edge technology. In the final stage of production, experienced engineers conduct a spraying test for every airbrush to be shipped. Only those proven to meet our stringent criteria are put on the market. What’s New on the Micron SB-2? 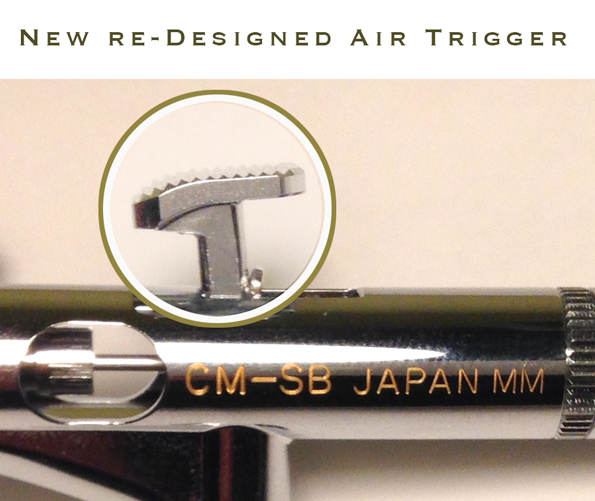 Re-designed trigger: Higher than the previous version, improved ergonomy. Cap Dock (Patent-pending): Attach Crown Cap to Cap Dock during painting job so that you will not lose it! Needle Chucking Guide with Auxiliary Lever: Combined Needle Chucking Guide and Auxiliary Lever for easy maintenance. The nozzle base, which is different from the conventional type of head, has three holes for air passage, taking into consideration the flow of compressed air. This causes the air to be dispersed, thereby enabling fine atomization of the spray. The nozzle head system, which consists of four parts, undergoes repeated spray testing and fine-tuning until the spray characteristics are as perfect as possible. The nozzle is available in two bore sizes: 0.18 mm (smallest) and 0.23 mm. Enjoy drawing fine lines with our superb airbrush. 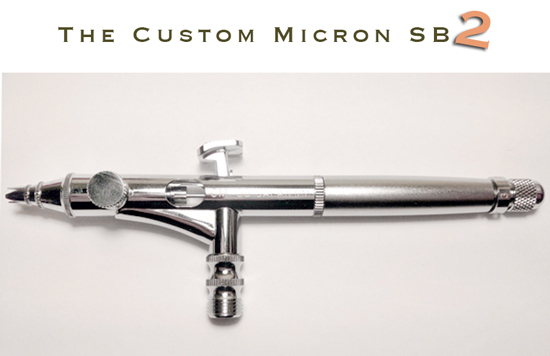 Every Custom Micron Series airbrush comes with a scaled preset handle. The handle enables the paint flow to be adjusted. 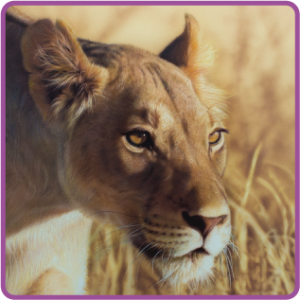 With the scale, it is always possible to set the paint flow to the same value.